If is possible to create and add to opera any funkcionallity to remove form internet i'm not a robot asking pictures choice . Is very frustrating and nervous and waist of time especially in mobile version -is tottaly nightmare when i must 1000 times singn stupid pictures and only see: try again, see next pictures , and other like that. Opera can You help me ? RE: Opera sync AGAIN not working! What is the password opera to synchronizing bookmarks.opera allways want this stupid pass. My opera pass is not correct ,so what is the pass. Problem in Mobile opera (synchro is tottaly wortless and un fnctionall s..t in mobile ) and PC windows version. Remowe this pass asking in source code or give me this pass. opera settings panell how change ? Description: restore old (55.0) setting panel. Opera setting i cannot find anything and not see where is setting witch I want in that moment. 3.open settings panell and see crashes . Expected result: old panell form opera v.55 , maybe like an option to choice by user old or acctuall new. how restore old (55.0) setting panel, in opera://flags is not possible because crashed and restarted, cannot set new value and after reload open setting panell. Only see error and crash. I want old Opera setting not chrome crap, when I cannot find anything and not see where is setting witch I want in that moment. Please try again later. You can click the reload button to try resubmitting your bug. No i can't disable this beacose opera crashed and restarted when I try open settings after changes value in opera://flags. How fix this issue and get old settings in this opera 57.0, From what I see is opera beta and opera stable also have a new (worse) settings panel. how fix to normal panel in old opera, I hate this chrome f... crap.I can't find the anything and can't normal use like old browser where I had everything set for myself and clearly, legibl I had everything set for myself, had everything knew where what is and how it is, Opera worked great wonderful as gold is. Maybe some extension can fix this madness and back normal opera settings. Wher is it, i can't see it, what about settings panell ? how restore old (55.0) setting panel, in opera://flags is not possible because crashed and restarted, cannot set new value and after reload open setting panell. Only see error and crash. I want old Opera setting not f... chrome crap, when I cannot find anything and not see where is setting witch I want in that moment. Way You remove cookies setting - on, on without 3 party c, off, remove all etc. In 57 is gone, I cannot sett in on or off, clean it or do anything in this f... chrome panell. Cannot login to my mail site beacose I must cookies on this, cannot open any site with ddos protection, I installed cookies add on but is not helped. Fix this and remove chrome anoying from opera. How to disable notifications of closed popup window or page, it takes 10 minutes and I have to wait until the notification disappears to close the page because it obscures the status bar. 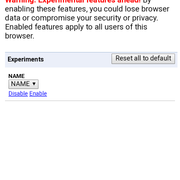 opera 48.0 android.